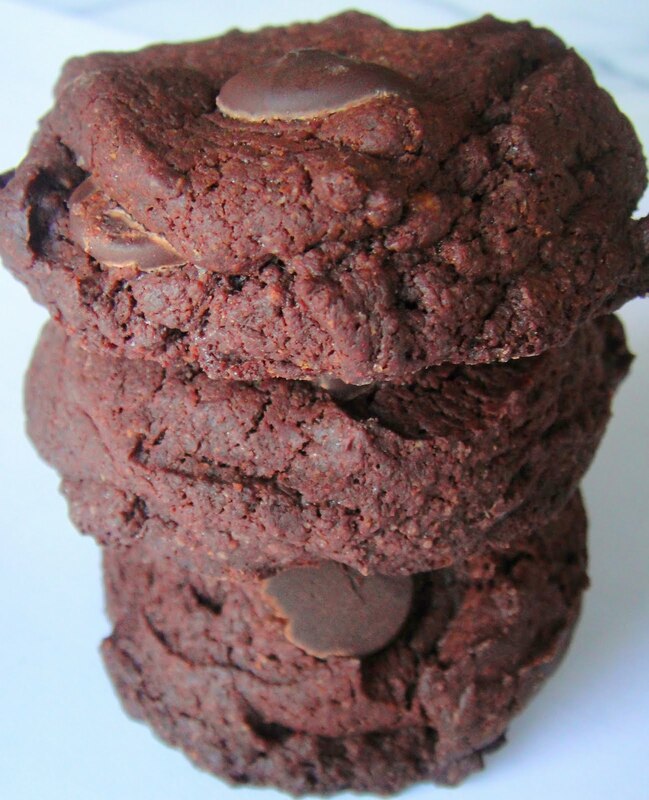 Healthy and Gourmet: Double Chocolate Chunk Cookies made with Spelt Flour. Say what? Double Chocolate Chunk Cookies made with Spelt Flour. Say what? Spelt is a variety of wheat which seemed to have originated in central Europe but has now gained popularity in the US as a health food. Compared to all purpose flour, one cup of spelt flour contains 16 grams of protein, 88 grams of carbohydrates, and 16 grams of fiber. All purpose flour, on the other hand, has 13 grams of protein, 95 grams of carbohydrates, and only 3 grams of fiber. While spelt is more similar in fiber and protein content to whole wheat flour, it has less gluten than whole wheat. Therefore, it does not produce an elastic and well risen dough when used as the sole source of flour in some bread recipes. Here, it works perfectly as a substitute for all purpose flour in this recipe. My goal was to create a relatively nutritious version of a chocolate chunk cookie. (I use the term "relatively nutritious" loosely because, let's face it, "double chocolate chunk cookies" in any scenario does not elicit thoughts and comments on nutrition.) Pure whole wheat flour is just too heavy and creates a very dense and dry cookie but, if you cannot find spelt flour, then go right ahead and use all purpose flour. Also, instead of using all dark chocolate like I did, semi-sweet also does the job. And don't forget to enter the giveaway for a chance to win an 8" Emerilware frying pan. Contest ends Friday 9th at 3 pm. 1. Set oven to 350 degree F. Spray cookie sheet with cooking spray and set aside. 2. Melt 2 cups of the chocolate chunks and the butter in a double boiler. Once melted, remove and allow to cool to the touch. 3. While the chocolate is cooling, combine spelt flour, cocoa powder, cinnamon, baking powder, and salt. 4. To the melted chocolate, mix in the sugar followed by the egg and egg whites. Add the flour mixture and combine well. Fold in the remaining 3/4 cup of chocolate chunks. 5. Scoop two tablespoon mounds unto the prepared baking sheet, and press down lightly to create a mound with a flat top. Bake at 350 degrees F for 15 minutes. Cool completely on wire racks before serving. Say mmm! What a cookie. Looks truly mouth-watering and rich. Can't go wrong with the fiber either. Spelt flour is amazing. I use it a lot in my kitchen. Works well when making batters. Cookies look tasty. I love to use spelt flour but I prefer the wholemeal spelt flour. I combine half of my quantity of wholemeal spelt flour with half of normal organic flour. These chocolate cookies look delightful! I recently made wholemeal spelt chocolate &ricotta muffins with dark chocolate chips! That's right. In general the average north american diet is lacking in both soluble and insoluble fiber. I'm learning that spelt is easy to incorporate in cake and cookie batters, even though it doesn't work too well in bread dough. I haven't tried whole meal spelt but will be on the look out for it at my next grocery trip. This looks OH, SO good!!! These are "THE BOMB"!!!!! I have looked for good recipes using alt. grains and this is the first one to SURPASS the mark! I accidently used oat flour instead and they still turned out excellent. THANK YOU!! Slightly overbaked our cookies and think we flattened them out to much thought you could substitute white chocolate for the chunks at the end. A delicious cookie though just a bit of fine tweaking. Look forward to baking them again! Thanks for your feedback. Glad to hear that you would try them again!